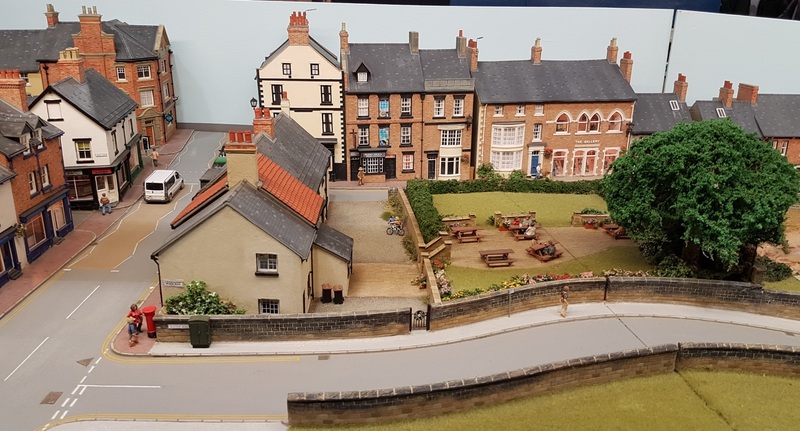 Lacey Dale, in ‘N’ is another of the Model Railway Club’s ongoing projects. 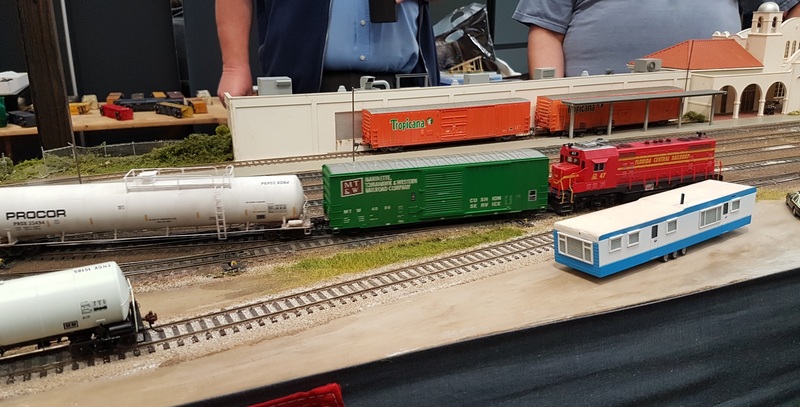 I do like the way they bring along their projects to show layouts under development. 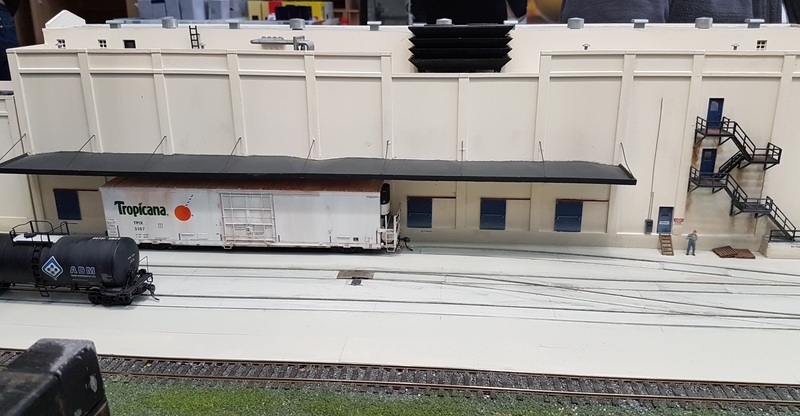 And Lacey Dale also shows the potential for a N-mod or N-club modular layout with an operating section below the through lines. The only issues here are perhaps the depth of the baseboard, and also that the through lines are at the back, not the front, of the layout. 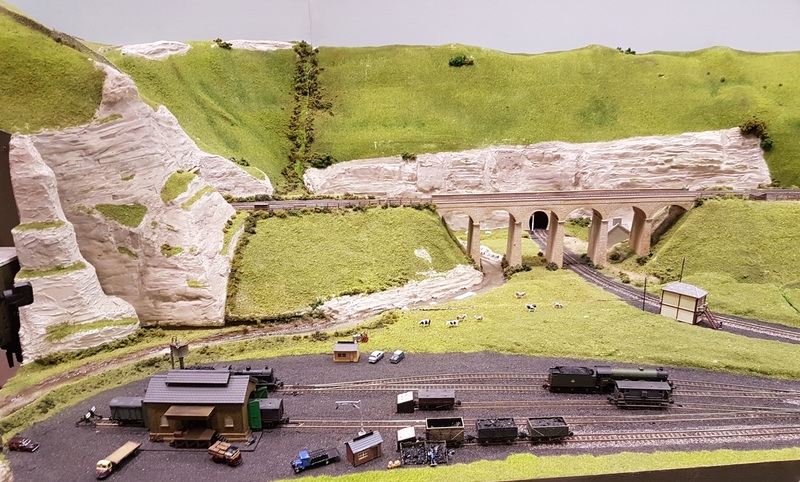 Bluebell cutting is another ‘N’ gauge layout, much smaller, and a simple double track loop. 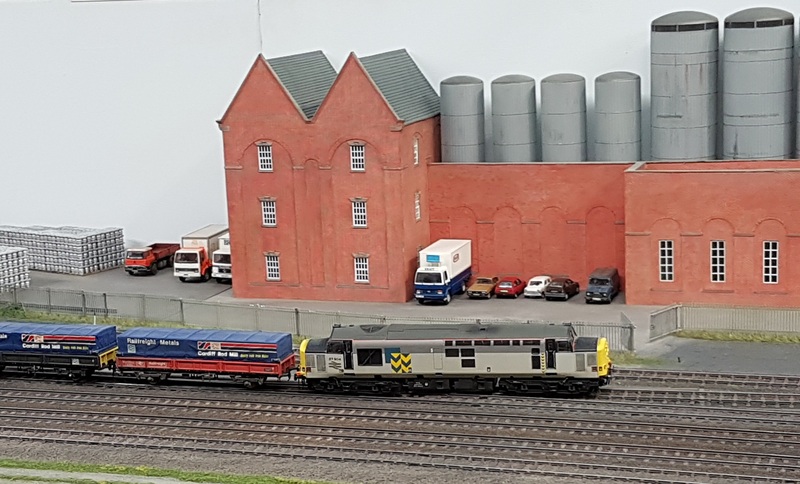 It was a sensible first layout for the owner. 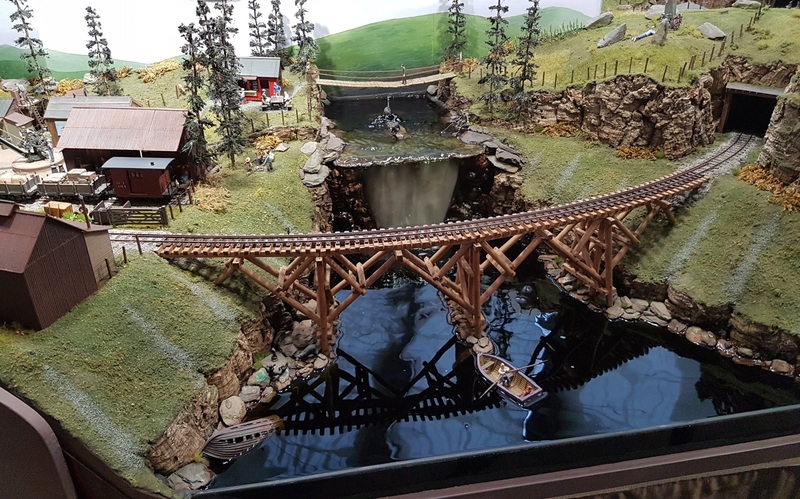 However, I liked the curves on the main line avoiding straight track in the visible section, and the many interesting scenic details. I seemed to miss the passing trains on Clifton and Lowther (also ‘N’). Based on a real location of the West Coast main line, I really liked the sweeping curves and the delicate track work (Finetrax Code 40). Another example of how to do a main line ‘train spotting’ layout. In ‘OO’, ‘The World’s End’ is based on Knaresborough in Yorkshire. 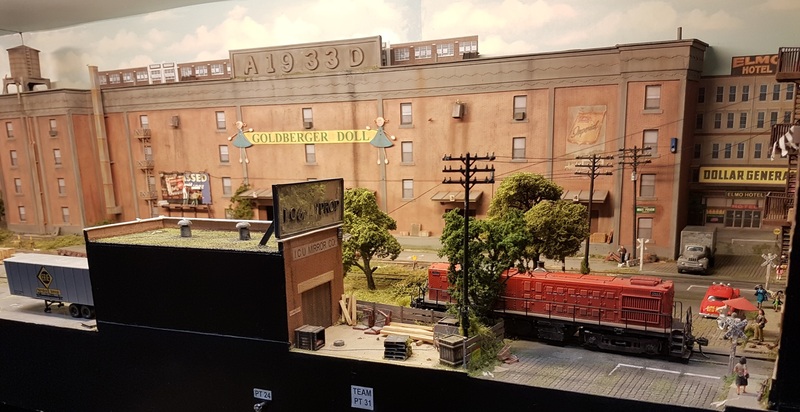 No points, but the layout is full of interesting (and real) scenery and buildings, that give you plenty to look at between trains. Just the right number of people and vehicles around to bring the scene to life without it becoming hyperactive. I’ve never seen a battle reconstruction modelled before! 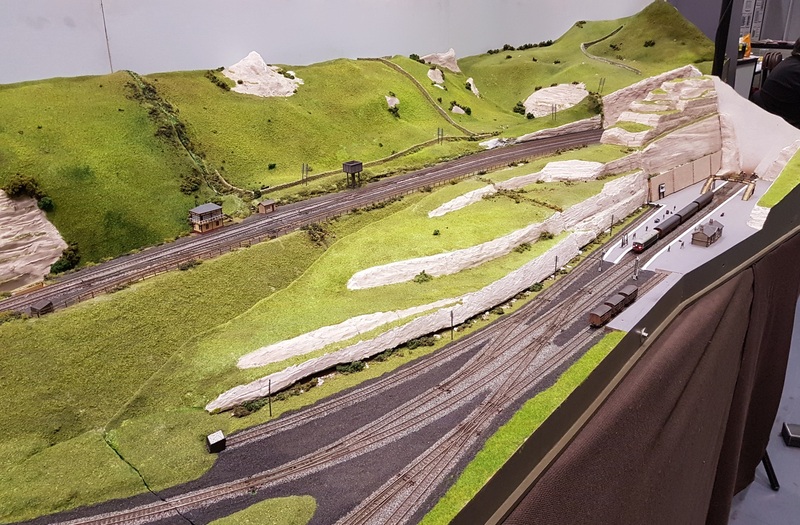 Another good example of an exhibition layout with an attractive location to watch trains. Finally, in this look at roundy layouts, was Calcutta Siding in P4. This, I’m afraid, was the layout that didn’t appeal. Well executed, but to me there seemed something missing. Was it the long, straight tracks, that looked like an N-mod layout? This was probably prototypical, but a few gentle curves would have made things less angular and more interesting. 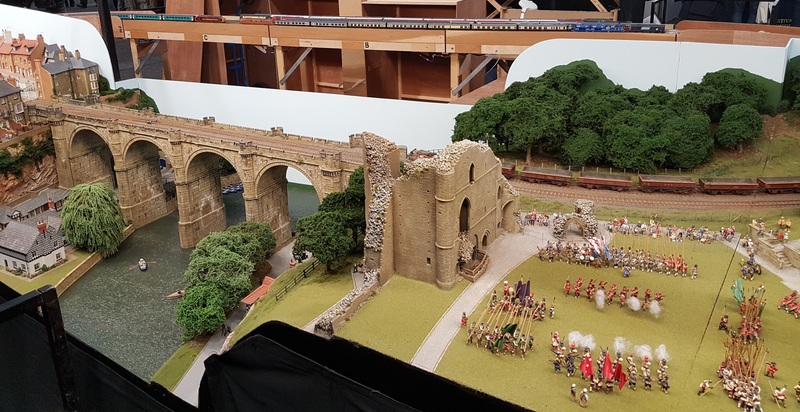 Or perhaps it was that all the detail was in a narrow strip at the back of the layout? I thought the area around the running lines looked very bleak. Again, this is prototypical, but I though it cried out for a PW gang, or a little debris and clutter, to bring it to life. Probably just my prejudices again, and I’ve seen some positive reviews. Sorry! And now for something completely different. Karolina Falls in On30 featured real water on the falls. You’re a braver man than me Mr Bailey! You can get away with real water in the larger scales. In the small ones, water doesn’t ‘scale’ properly, due to surface tension and viscosity not scaling in the same way as x-y-z dimensions. (Hydraulics engineer coming out here, and the problems in scaling physical models of rivers.) And I liked the dinosaur at the back of the scene. More viscous water, with the Miami waterway in Fort Myers (HO). Note the egret, front right. Elsewhere on Fort Myers, there was plenty of switching going on. Also HO American was 59th and Rust. We swap rural Miami for a very urban, and very grimy, and very run down New York. Once again, lots of switching going on. I didn’t mention the shopping. Not much in the way of bargains, and the rents for stalls have got so large that it’s mostly the box-shifters that can afford to go. Though it was good to stop by for a chat with Ray and Bob on BH Enterprises. But I came home with a Dapol Britannia for £60. Hope the wheels don’t drop off! So that’s Ally Pally for 2018. 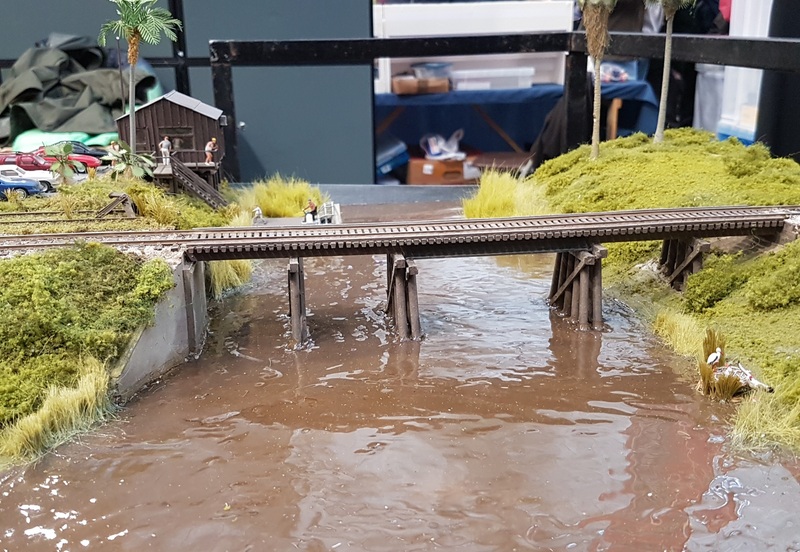 Despite the occasional winge, I’ve no doubt I’ll be back next year for some excellent railway modelling. 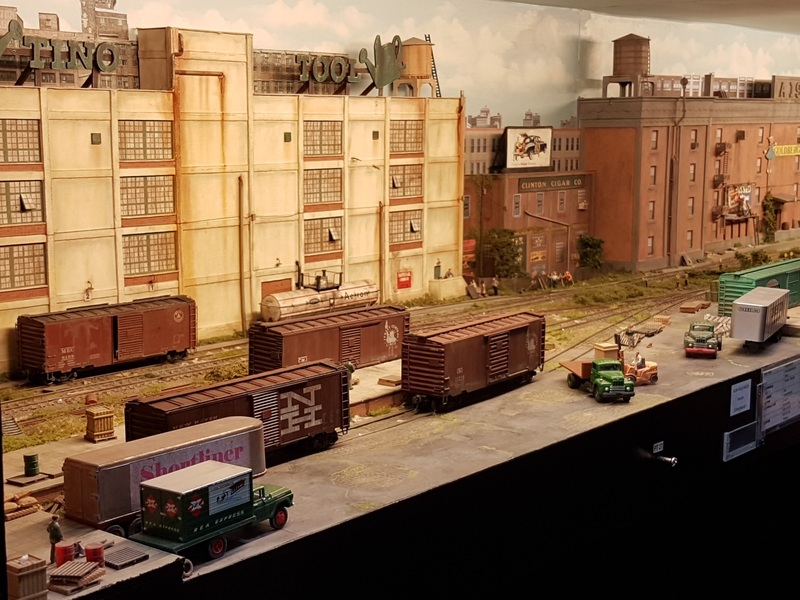 This entry was posted in Inspiration, Out and about, The trade and tagged exhibition, N gauge. Bookmark the permalink.